Nanoé Madagascar is a young French-malagasy social business moved by the conviction that it is possible to integrate energy access and employment creation in Africa through the implementation of a new electrification model based on renewable energies, digital technologies and local entrepreneurship. The ambition of the innovative electrification solution developed by Nanoé, named “lateral electrification”, is to combine and surpass the short-term merits of individual power solutions (i.e. rapid, easy and affordable access to basic energy services) and the long term benefits of centralized grid solutions (i.e. reliable, full and optimized access to modern energy services) by answering un-electrified people's urgent needs more efficiently and sustainably than current decentralized power solutions while participating in the progressive bottom-up building of 21st century smart power infrastructures more flexibly and economically than current centralized utility models. 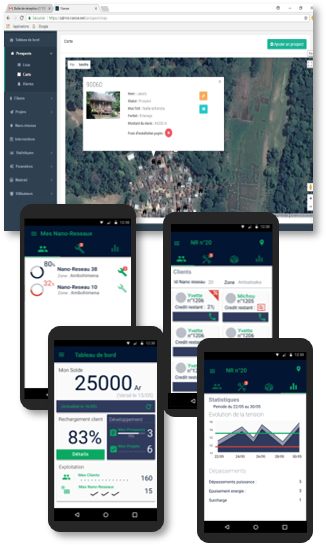 Demonstrate the full viability and relevancy of the lateral electrification model by achieving a first interconnection of several Nanogrids within a village- wide balancing Microgrid.